Social Media Policy Template Free « @HireRabbit Social Recruiting Blog! Provide practical guidance to employees for responsible, constructive communications via social media channels. Social Media offers boundless opportunities to help businesses further their market status. However, with these opportunities come heavy risks. The responsibilities of engaging in Social Media are strict and they must be upheld. One little slip-up may dramatically affect your company’s performance and public perception. That's why it is important to have an appropriate social media policy in place. 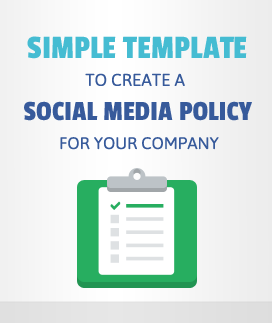 And here we have got you a simple template which you can customize to create a policy for your company.